With a strong emphasis on academics, Saint John Paul II Catholic School appropriately challenges our students at each level. We offer a range of academic coursework including Integrated Math I and Integrated Math II. Our curriculum stresses academic achievement within a Christian community where every child feels loved and respected by his/her peers as well as the teacher. We utilize Vatican II texts, ensuring compliance with the theology of the bishops of the world. In addition, students participate in electives and enrichment experiences that include art, music, Spanish, physical education, health, and media time. United in meaningful liturgy and prayer, our students can further come to an understanding of the Christian life. At Saint John Paul II, we are attempting to, "teach as Jesus did." We believe a quality Catholic education calls us to integrate Gospel teachings and values with real life. We believe all secular subjects need to be taught in the light of these values. We recognize and accept that parents are the primary educators of their children; therefore, we work closely with parents in all areas of our students’ growth. We believe students of all faiths, ethnic origins, and economic levels contribute to the world community, and thus we welcome these students and strive to reflect the dignity of each person. We believe that prayer and worship within the total life of the school and parish community nourish faith shared with parents, teachers, and students. We believe students reach their individual potential by thinking clearly, forming strong convictions, and acting in ways consistent with their beliefs for the betterment of their own lives, their church, and society as a whole. We follow the Diocesan curriculum guidelines, consistent with the State of North Carolina guidelines, for the teaching of all secular subject areas. Marked by current content and fresh approaches to methodology, our curriculum places emphasis on principles, facts, and learning through problem solving rather than by precept. We strive to offer a program that makes use of many sources of reading material, a wide variety of audio-visual and technology tools, and a multi-text approach to the content areas. 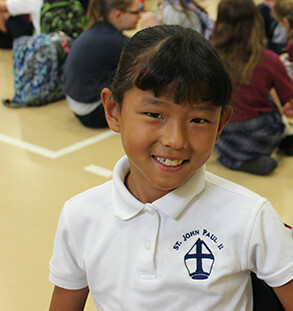 The sacramental life of the children of the Catholic tradition is an important component of the religion program at Saint John Paul II School. Preparations for three sacraments, Reconciliation and Eucharist, form the core of our efforts in second grade and Confirmation in eighth grade. In accordance with the Diocesan guidelines, candidates for First Communion receive the sacrament of Reconciliation prior to First Communion. We require parents to be active partners in the preparation of their children for these sacraments. Conferment in the sacraments of Reconciliation, Eucharist, and Confirmation is only available for students baptized in the Roman Catholic tradition. We permit students to retake quizzes or tests to demonstrate mastery of skills and/or concepts. We limit the number of quizzes or tests administered per day to three for students in sixth through eighth grades. Middle school students may also participate in end-of-semester exams. Students in third through eighth grades participate in the Iowa Test of Basic Skills. In addition, second and fifth grade students take the CogAT. Refer to the links on this page more information about these testing programs. Students enrolled in Integrated Math I complete the North Carolina Math I End-of-Course Assessment to determine 8th grade and high school math placement. We want every student to have access to the tools he/she needs to succeed. We may conduct or recommend diagnostic testing if a student has difficulty in mastering the basic curriculum in any area in order to ensure that we provide an appropriate education based on his/her needs. For more information, please refer to the St. John Paul II family handbook. RenWeb is your go-to resource for grades, curriculum details, and much more. Check in often. We issue report cards three times during the academic school year (approximately every 12 weeks). In addition, parents may download progress reports at the midpoint of each grading period on RenWeb. Accredited through AdvancED and the state of North Carolina.